Now if we were given the job of re-designing Herr's Chips packets, and we should do, because we would make an amazing job of it, increase their market share and profits instantly!.. Anyway, this would be a rare one that would get minimal treatment. While it is old fashioned, it should be. They have a number of old fashioned recipes that would look great in similar packaging, as a separate, 'specialty' line to their regular Chips. Again, these are much the same as most of Herr's standard Chips. They have a crispy crunch rather than a bite full of chomping crunch. They melt in your mouth a little too quickly. These Chips are of the standard Herr's variety - they have a little too much grease about, they are mostly nicely shaped, have a sufficient thickness to avoid many broken ones in the bag and have enough seasoning on them to give the Chip a bit of character. The general color is a dark reddish brown. 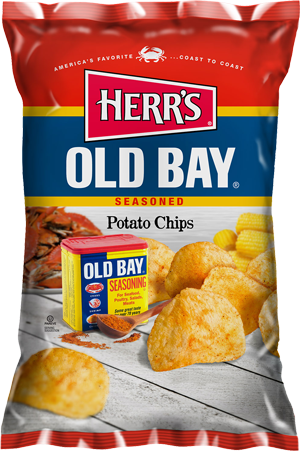 If you are from Maryland you are likely to be accustomed to seeing Old Bay crab seasoning powder on your store shelves. The Seasoning is named after the Old Bay Line, a passenger ship company that worked the waters of the Chesapeake Bay from Baltimore to Norfolk, Virginia, in the early 20th century. It contains pretty much a pinch of everything on your spice rack, from Paprika and Cayenne Pepper to Ginger and Cinnamon. To our untrained palates it tasted a little like salty beef stock, with a touch of vinegar and maybe a little pinch of the tank water restaurants keep their shellfish in. We are not the best judges of this particular flavor, but it is incredibly original and deserves praise because of that.